"We learn from the company we keep." Each semester, I ask my graduate students, who are learning how to be schoolteachers, to write about a learning experience they had. This is a prelude to thinking about how real, memorable, non-rote learning actually happens. I ask them for a memory of learning which was not based on formal schooling; rather, they recount a time when they learned something easily and pleasantly, simply by being in the company of someone they wanted to be with. And their memories are usually of someone who knew how to do something well and transferred that information to them. When we go around the classroom and read these stories, I share too. Almost invariably, my memory is about cooking with my mother. Jennifer at Domestic Goddess provided the impetus for this post with her call for fond food memories. I learned how to cook from my mother. She didn't teach me; it was just one of our ways of spending time together. She was a busy working mom; my parents had a small business and often worked six days a week and sometimes evenings in order to keep things going. On Sundays, so, we would cook. We laughed and played in the kitchen. My mother was a woman of remarkable warmth, beauty and humor, and it was from her that I learned that it doesn't matter so much where you are when you're with your loved ones -- it's how you spend the time you have together. My mother had tremendous political convictions, and was a merciless and gifted mimic. So we had "important" discussions, shared jokes, and talked in funny voices, using our own family short-hand. My brother, who is an excellent cook, was there with us in the kitchen much of the time too. My father kibitzed from the doorway, asking us why we were adding various ingredients. My brother and I used to call him "the backseat chef" since he almost never did any of the cooking, but simply enjoyed a bit of interference here and there. Often we made soups or stews, so that there would be food in the house for the week. That way my parents could come home from work, relax a bit, and then together we would heat up the good things we'd made over the weekend, set the table, and have dinner, complete with daily doings, laughs, spirited arguments and ocassionally a doozy of a fight. One of our favorites was a dish my mother called Potted Chicken and Meatballs. It's not potted in the sense of a preserved meat, but rather gently simmered or braised, like a pot roast. This is a homey, easy but somewhat time-consuming dish to prepare. It gives great dividends, however, in its fragrant gravy, chicken as tender as mother-love, and delectable meatballs. It was a perfect family meal for us, since my father wasn't fond of chicken, although he loved that gravy, which is perfect over mashed potatoes, rice or kasha. Mostly he ate the meatballs, and we the chicken, with a meatball here or there for variety. One weekend when I was about 10, we went up to Massachusetts to visit my aunt and uncle, as we did several times a year. You can imagine my surprise when my Aunt Emma pulled a big pot of chicken and meatballs out of the oven, a dish I thought unique to my mother. My mom explained to me that she had learned the dish from my paternal grandmother, and that it was a family recipe, which is why my Aunt Emma, who was my father's sister, would make it too. My mother died more than three years ago. She had a very good death; she knew she was dying, chose to have no further surgery and gathered us serenely around her hospital bed. She told us that she had loved her life, and she wanted us all to love our lives. Lucky, lucky us, to have such a benediction. I missed her so intensely and so heart-breakingly that for a good while, I wore her clothes, her jewelry, and cooked dishes that reminded me of her almost every day, invoking her and keeping her as close as I could. I asked my brother if he thought I was nuts to wear her clothes. "No, " he said staunchly. "If anything of hers would fit me, I'd wear it too." And so a tearful moment turned around, as the image of my big brother wearing my tiny, elegant mother's clothes dissolved us in laughter. I still wear her things and cook her food, but not quite so obsessively, for although I miss her without ceasing, I've come to understand something that a director of mine at my job told me during that time. Crying in her office about 6 weeks later, I said "Marcie, when will I get over this?" Marcie looked at me gently. "You don't get over it. You just get on with it." Not long ago I made a large casserole of Potted Chicken and Meatballs, and took it up to my father's apartment for a visit. My brother was there too, and we all ate together. My father smiled and patted my hand, happy for the visit and the familiar food. My brother, who is an omnivore but lives in a pesce-vegetarian household, couldn't stop eating. He eats meat in restaurants, but doesn't get a homemade chicken or meat dish all that often. When the potatoes were gone, he went into the kitchen for bread to sop up more of the gravy -- a habit he usually avoids, since he's a moderate carb-watcher. He grinned at me as he swished the bread around his plate. "It tastes exactly like Mom's," he said, his eyes glistening slightly. I sometimes make this without meatballs, just in the interest of time and not making more food than we're likely to eat in a few days. But honestly, it's not quite the same. The meatballs add a lot to the flavor of the sauce, and they're delicious in their own right, since they also benefit from their bath with chicken and gravy. On the other hand, if I'm serving a crowd, want to bring some to my dad or I have freezer space, I double it. It's definitely at its best a day or two after being made. Out of curiousity, I've searched for similar recipes in Jewish cookbooks to see if I could find the provenance, but have never come across a recipe similar to this. It's not uncommon to see the chicken and meatballs together, but they're usually in a tomato sauce or a "fricassee", whatever that is. These are estimated quantities; like all dishes one learns to cook by watching, I do this by feel rather than by quantities. Friends have made it using these measurements and were very pleased with the results. Optional: your favorite meatball recipe, made with about a pound of ground beef or turkey. Mix flour with seasonings in a large bag; toss chicken in and shake until well-coated. Heat vegetable oil in a large sauté pan, and brown chicken well on all sides. Remove to a dutch oven. Sauté chopped vegetables until soft and golden in the same pan as you did the chicken; put them in the dutch oven over the chicken. Deglaze the pan with wine and stock; pour over the chicken and add herbs. Make sure the chicken is almost covered with liquid; add a bit of water if necessary. Cover, and cook in the oven for 1 1/2 to 2 hours. Check every so often. You want to achieve chicken that's incredibly tender, almost falling off the bone but not disintegrating, in a rich aromatic gravy. If you want meatballs: Once you've put the chicken up, make a batch of meatballs with about a pound of ground meat, using your favorite recipe. Roll them into golf ball sized balls, brown them lightly, just enough so they'll hold together, and put them in the dutch oven to cook along with the chicken. Serve with mashed, rice or my favorite, kasha varnishkas -- and a nice green vegetable and/or salad. Thanks for sharing the beautiful picture of you and your mom, Julie. What a dear lady with a very dear daughter. Julie...what a beautiful and tender post! See, this is the kind of posts I like to read, where the writing just draws you in and makes me WANT to try the recipe! Of course, along with the cannoleons, I must try this one as well. Thank you for sharing! JULIE~Thank you for sharing your beautiful family love story. What a lovely tribute to your mother. Cooking her foods keeps her close to you, and that's so important. A great post. I've been cooking my mother's recipes too--she died 6 yrs ago, and I'm still getting on with it. Unfortunately can't wear her clothes--I'm a lot bigger than she was--but I wear her jewelry a lot. I just spent 20 minutes writing a comment about how amazing and beautiful and brilliant this is, only to have Road Runner crash as I hit the post button. You'd think I'd learned my lesson about using a paste buffer by now, but no, I am a silly person. It's probably just as well, because I ended up bloviating a bit about food memory and the difference between experiences that evolve naturally into memory and those that are created for the purpose of evoking memory (I'm not a fan of the latter), and I think I ended up working some Milan Kundera in there. No, it's just as well that it's gone. Thank you, Julie. I don't have the words for just how wonderful this is. Julie, I was sobbing like a baby by the time I got to your mom's recipe. What a wonderful piece of writing- thanks so much for sharing it with us. What can I say? I'm speechless and more than a little tearful. That was a wonderful memory of you mom, and a beautiful picture of you both. I have been meaning to comment on this incredibly lovely post for a while now...All I can say is how grateful I am to read it (over and over) and to be mentioned in it. Thank you, sweet little sister. Thank you so much for posting this! It's a wonderful post - and it's a wonderful recipe! I just made it tonight, and me and my fiance both loved it. It's a bit unusual from regular Swedish homecooking, and it's fun to try something new. It was really nice - thank you. Anne -- thanks so much for your kind words, and thanks for stopping by. It's great that you liked the recipe! And by the way, I like Scandinavian food too...or at least some of the dishes we know about here -- svenske kottbullar,gravlax,smorrebrod,swedish apple cake -- things like that. Since I've read about the story of your potted chicken recipe, I did realize how you truly treasure your mom and her cooking. What a sweet tribute to your mom Julie! Today I was able to finally try out your "heirloom recipe" and the result? Boy, it's absolutely delicious! I loved it, I loved it, I loved it! Hubby was real pleased and he loved it as much as I did. In fact, he suggested I should make this at least once a week. By the way, I used dried thyme and mixed herbs and thought it might not be as good as the fresh ones but it's quite nice actually. Also, I made swedish meatballs to go with the chicken. A real keeper indeed! Thanks so much for sharing this treasured recipe. Now it will become part of me and my family. Something I can also pass on to my children someday. Oh Elna! I'm very happy that you and your husband liked this recipe. At this point, a number of people have tried this out and reported back their happiness with the results. I'm so glad to have given this little piece of our family to others, and to know that they are enjoying it. Thanks again for commenting. I think you made this dish for me right after I gave birth to Roger, in November 1985. It meant a lot to me that you cooked for me, and I'll never forget the falling-off-the-bone texture, and the never-to-be-found-in-a-restaurant sauce. Joy! Delight! Flavor! Do I smell an Off-Broadway play in the making? 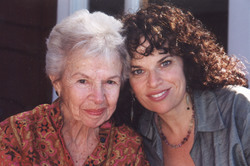 Your wonderful blog-essay brought your mother to life for me, too. Funny, when I picture her, I see her in the kitchen, just as you've described! My first husband's mother made a delectable pot of Chicken and meatballs often on a winter day for Sunday Dinner. I am so excited to try this recipe and share it with my daughters. I hope it is the same flavor. I will be nice to have something delightful from that long gone relationship. What a lovely story. As a nurse I am often faced with families and the dying of momma. What yo sais is what I say to my familes. you don't get over it, you just go on with it. as for the potted chicken recipe, mine is from my friends mother, who taught me as her mother taught her. Actually her recipe usues a special "pot" on the stovetop, no broth as the chicken itself has so much natural juices and we add carrots too. I also have my family kitchen moments as you, I really like to read this blog because you make me think about what I like to do in the kitchen and off! That is the kind of food i called it comfy food very nice ans easy to make i really cant wait to make my own recipe is really good to make this you never fail with chicken everybody like it. I really like any kind of recipes because it shows how it can be very versatile and always a good option for every table weather is for high class or low or standart class fits every budget very interesting thanks for the recipe. It's a good recipe! I think we can share more tips like this one, and I learned how to cook from my mother like you because she always prepared the best food. Specially of we're mentioning chicken with carrots. Actually her recipe usues a special "pot" on the stovetop, no broth as the chicken itself has so much natural juices and we add carrots too.